Kids might ask, "What's the economy?" when they hear it discussed on the news. They might understand that the economy is in good shape or bad shape but wonder what that means. It can be a difficult question for their parents because sometimes even adults don't know what to make of the day-to-day economic news, and that can make explaining particularly challenging. The economy is all about money being made and money being spent. We're talking about who has money, who doesn't have money, and whether most people are getting richer or poorer. Try sharing a few basic facts with your kids, keeping it appropriate to their ages and capacity to understand. The economy is made up of buyers and sellers. Most of us are both buyers and sellers. We buy what we want and need for our lives, and we sell our time and expertise to our employers. There are times when a lot of people have more money than they need to survive. When this happens, the economy is doing well. There are times when many people don't have enough money to buy what they need. The economy is doing badly when this happens. Giving kids a detailed, textbook definition of "economy" is likely to make their eyes glaze over, and with good reason. It's an abstract concept. Discussing the specifics of the economy can be more than a young mind can handle. A bad economy means we shouldn't spend too much money right now. We should only buy the things we need and take care of what we already have so it lasts longer, and we don't lose it. The news is good. More people have jobs so they can do more things with their kids. They can also buy what they need. Many people don't have jobs, so we need to be sympathetic to friends and family who are having a tough time right now. The prices of things we want to buy are going up, so we have to think about the right time to buy things or buy fewer things because they cost more. People in that country don't have enough money or jobs, and they have too little food. Our country is sending them money and food to help them through this crisis. "Yes, those people look very sad. That's why our church makes food baskets for them and raises money to help them find a safe place to sleep. Remember, it's not just what you say to your child but what she overhears when adults are talking. Kids take all this in, so unless you're very sure you're alone, and she's not privy to what you're saying, choose your words carefully. You don't want to teach her that the economy always means stress. You're balancing the good with the bad in the things you say to her directly, so make sure the same applies to your own conversations and make sure the negatives don't seem too devastating or harsh. "We're going to lose the house if the economy doesn't improve!" is a good example of something you might want to avoid. Discuss your financial life with your child—keeping the context age-appropriate, of course—rather than sheltering her from it. Games such as Monopoly, Game of Life, and Minecraft feature economic systems that allow kids to have fun while seeing how an economy works. Other online games and board games show kids how to manage money and resources as well. The best way for kids to grasp the meaning of the economy is to let them make financial transactions. Show your child how to earn money with an allowance. Teach him to save it, how to make a budget, and how to make purchases. Let them get used to making economic decisions before the world requires it of him. And don't overlook the lessons that are inherent in charity. Maybe your child could give a little of his allowance to a good cause, but it might be better yet if he can directly help someone else in need, someone who has been badly affected by the state of the economy. It might be a homeless person or even a classmate whose parent has lost his job. Take it beyond expressing sympathy for these people and help your child do something for them. 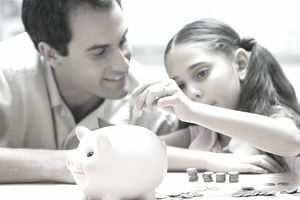 Start a savings account for your child.